Pegasus3 Symply Edition Series with Thunderbolt™ 3 technology delivers incredible speed and performance for HD and 4K video editing and creative workflow with ease of use and performance optimization from Symply. HD or 4K (Ultra-HD) workflow environments create enormous amounts of content. In many cases, that content is irreplaceable, and in every case, the loss of content is not just inconvenient but costly - especially if you miss your deadline. Pegasus3 Symply Edition Series combines lightning fast speed and advanced RAID protection to ensure your work is safe and secure. The amazing all-new MacBook Pro from Apple deserves the finest Thunderbolt™3 RAID available. Pegasus3 Symply Edition delivers the capacity and performance engineered by the industry leader Promise, and ease of use and optimization of Symply, to make even the most demanding creative projects easy. With dual Thunderbolt™3 ports, expanding devices or adding dual 5K displays is fast and easy. With 4, 6 and 8 drive configurations, from 12TB to 48TB, we have storage solutions to fit the unique needs of the production professional. Want more speed – use SSD drives, or adjust your RAID settings. Pegasus3 Symply Edition supports RAID 0, 1, 5, 6, 10 and JBOD. 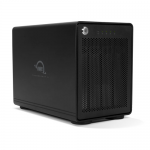 - Expand storage capacity and backup for workstations. Θύρες διασύνδεσης με άλλες συσκευές.